The Form of Cities offers readers a considered theoretical introduction to the art of designing cities. Demonstrates that cities are replete with symbolic values, collective memory, association and conflict. 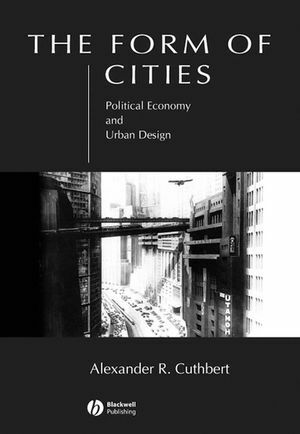 Proposes a new theoretical understanding of urban design, based in political economy. Demonstrates different ways of conceptualising the city, whether through aesthetics or the prism of gender, for example. Written in an engaging and jargon-free style, but retains a sophisticated interpretative edge. Complements Designing Cities by the same author (Blackwell, 2003). Alexander R. Cuthbert is Professor of Planning and Urban Development at the University of New South Wales, Sydney. He has studied architecture, urban design, urban planning, and political science and has a doctorate from the London School of Economics and Political Science. His previous publications include Designing Cities (Blackwell, 2003), which serves as a prequel to this book. List of Figures List of Tables. Spatial Political Economy and Urban Design. Philosophy and Urban Design 4. Politics. Power: Rights and Laws Law as Ideology. Introduction: Culture and Urban Design. Introduction: Gender the Missing Component. Gender and Society Gender and Patriarchy. Introduction: Nature and the City. Introduction: Aesthetics – Objects and Experience. The Aesthetics of Urban Form. Mathematics and the Divine Order. Introduction: Taxonomy, Typology, Morphology, System. Typologies Derived from Associated Disciplines. Typologies Derived from Traditional Urban Design Perspectives. Implications from Spatial Political Economy. "[Cuthbert] sets out not only to make the professional case for urban design but also the disciplinary case. What ensues is an immense and far-reaching catalog of ideas that in many ways is a tour de force." This text offers readers a considered theoretical introduction to the art of designing cities. Complements ‘Designing Cities’ by the same author (Blackwell, 2003).